BJB’s “L Series”, with its 20 to 35 minute work time, is perfect for manufacturing larger or more complex parts and molds. 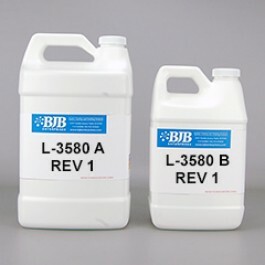 The L-3580 REV 1 is an 80 Shore A material offering exceptional physical properties. You’ll also find the 2:1 ratio to be extremely convenient. For faster work times consider BJB’s F-1 or M Series of urethane elastomers.